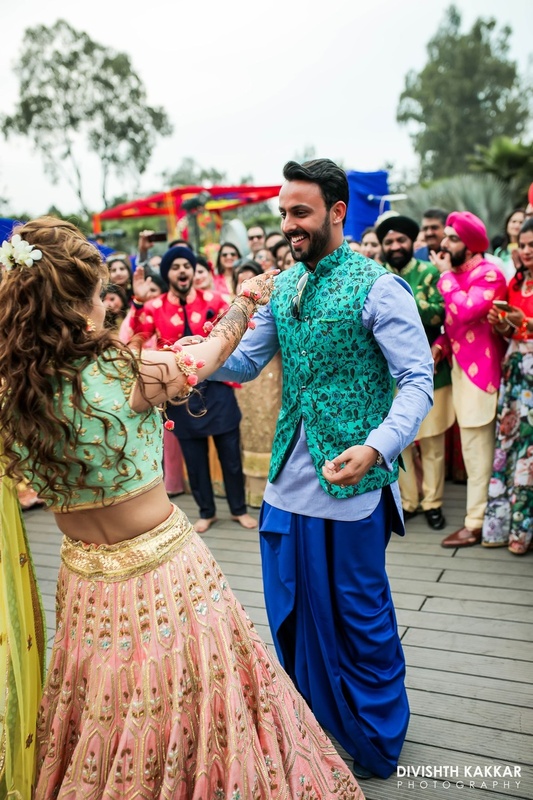 Synonymous with grand, a Sikh Wedding has all the essence that captures the beauty of Indian Weddings. 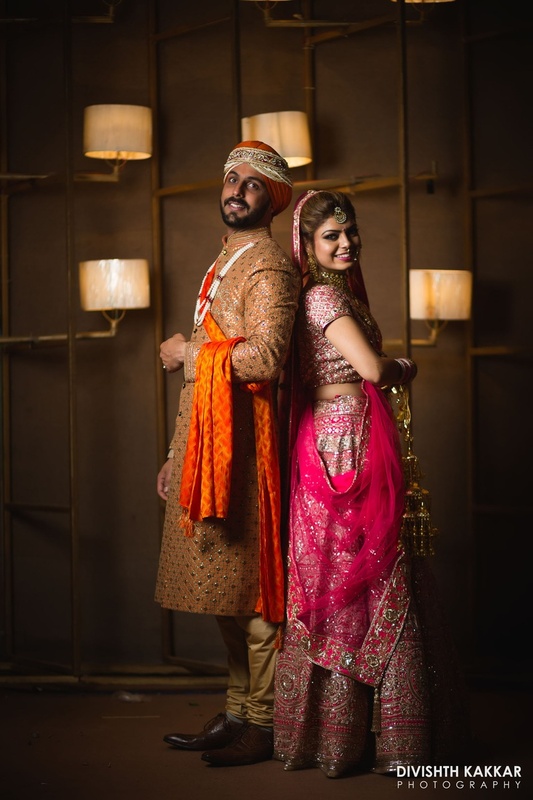 The bride looked gorgeous in her pink lehenga and so did the groom in light brown sherwani. 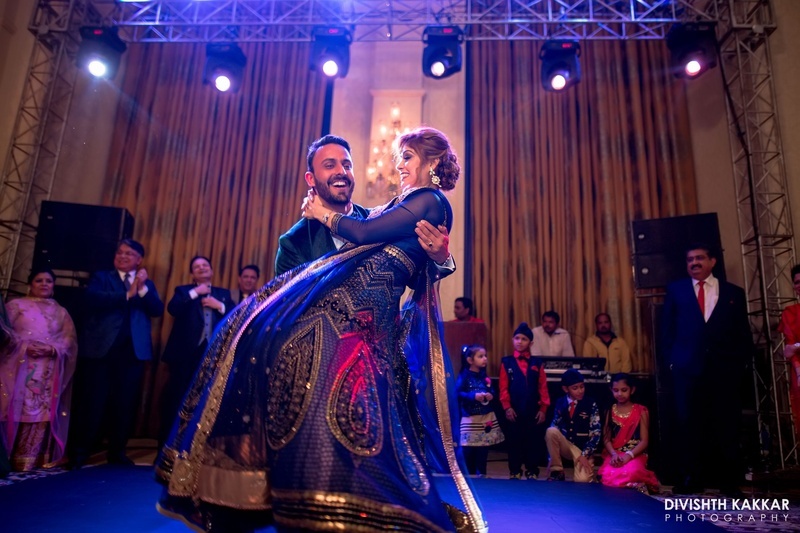 Colourful and traditional, this wedding had all the grandeur and masti that one looks forward to in a wedding. 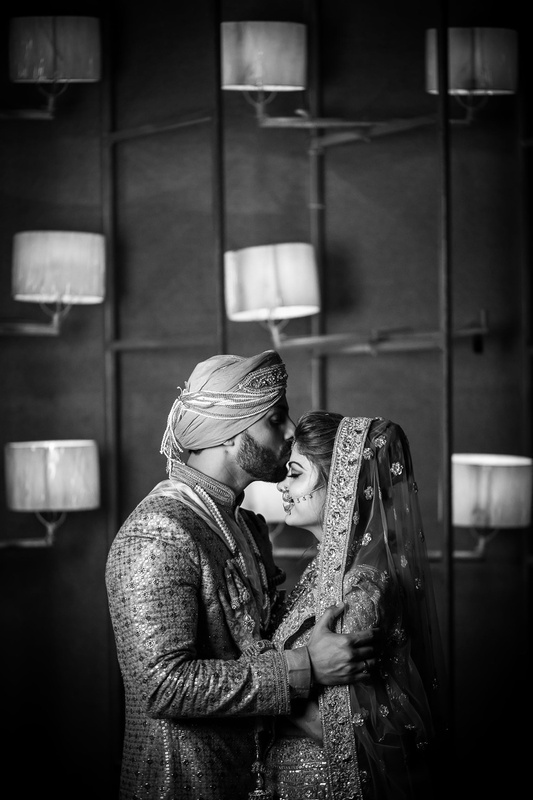 We could clearly see Sahil’s love for Gurpreet and we know that it’s gonna be forever. 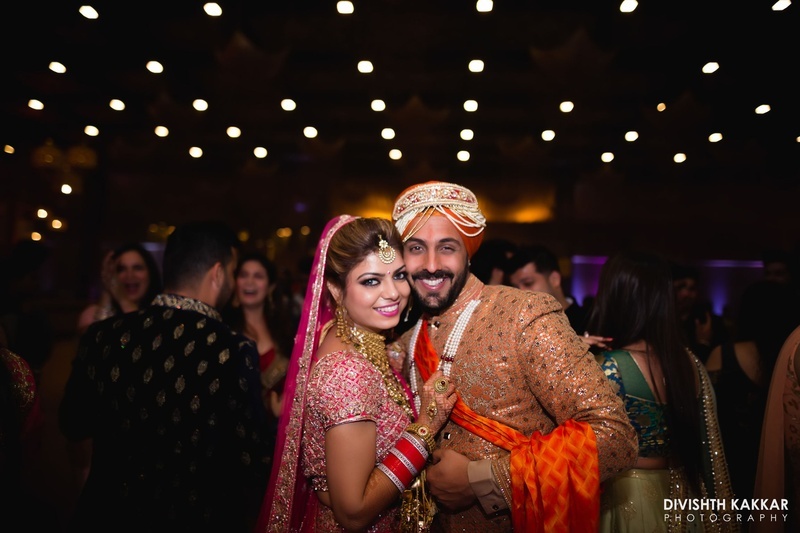 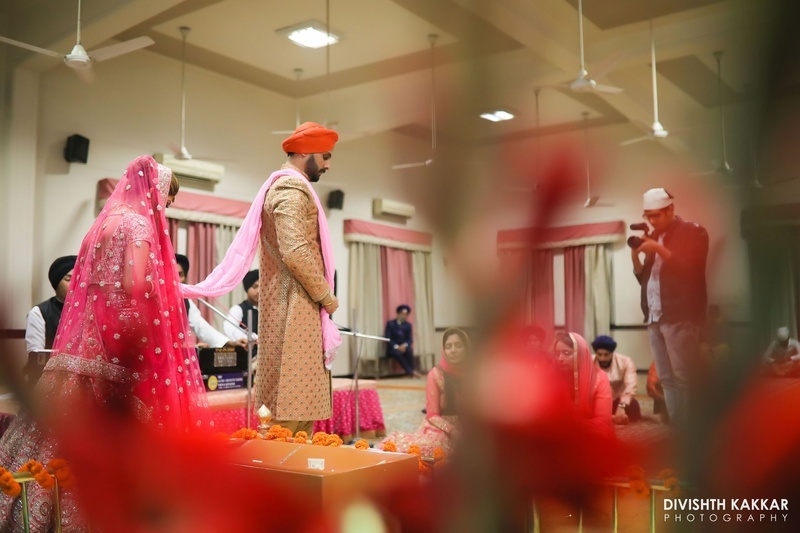 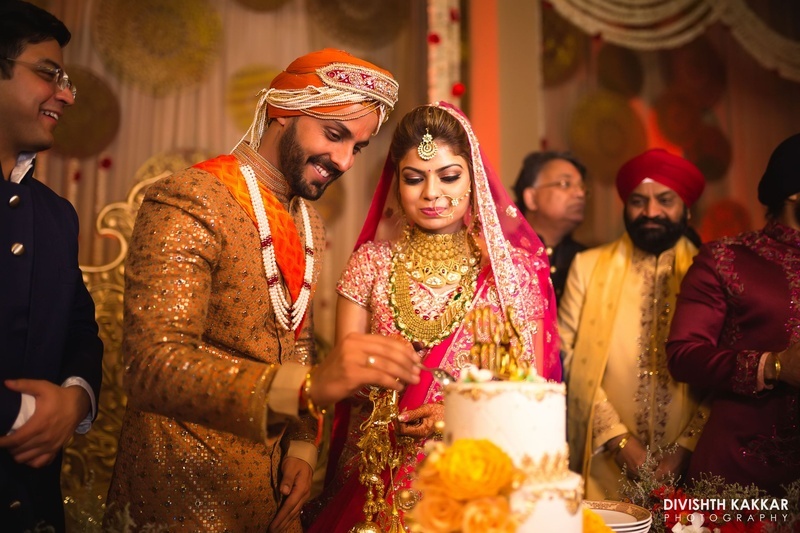 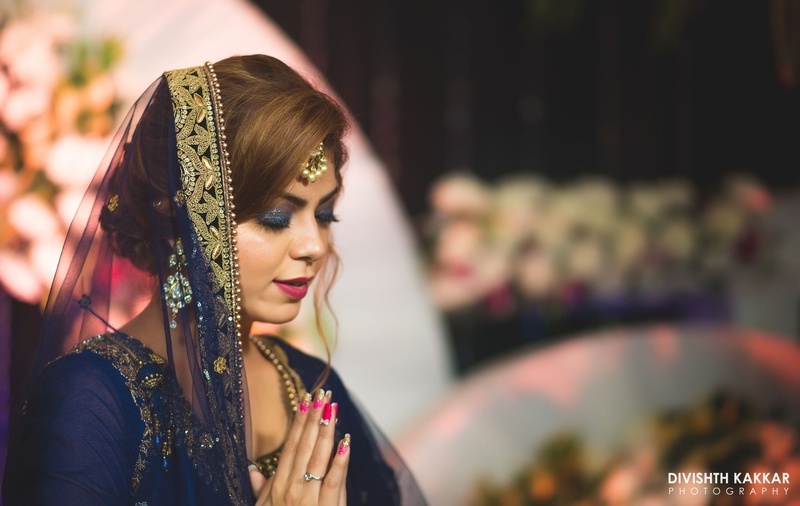 Have a look at some of the best moments of this Sikh wedding. 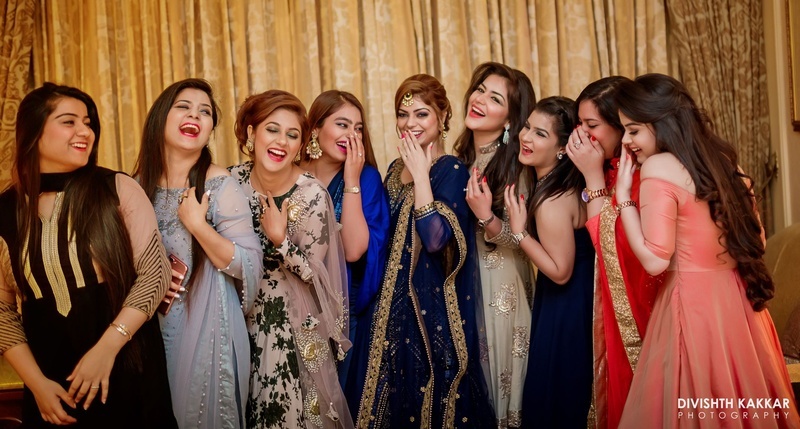 Pretty bridesmaids and their pretty smiles shot brilliantly by Divishth Kakkar Photography. 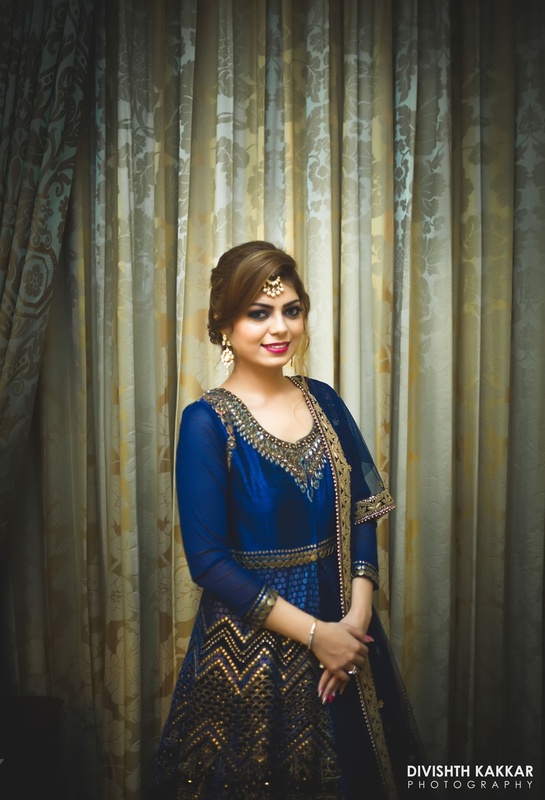 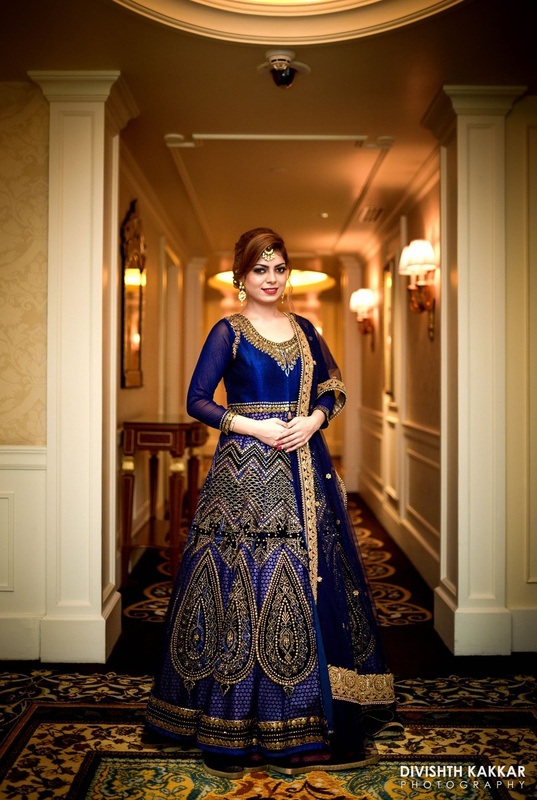 Gurpreet dressed up in a royal blue and copper color sequence work anarkali for the engagement ceremony. 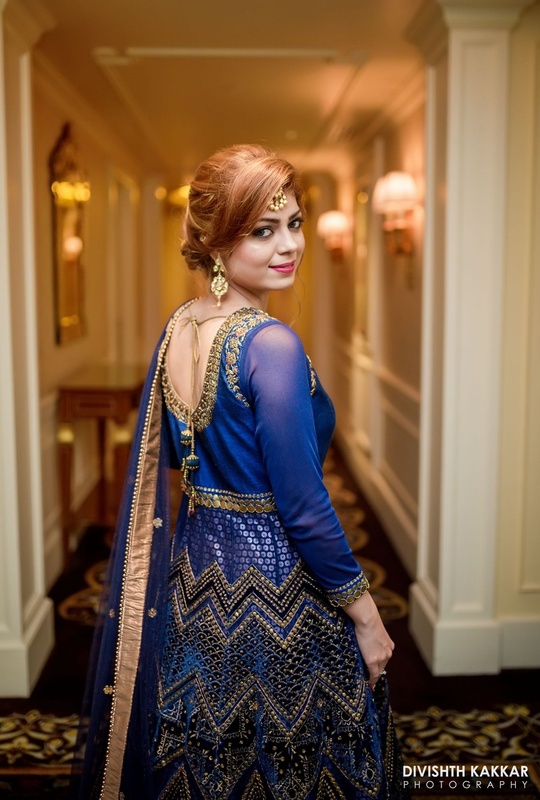 Totally crushing over this blue and copper work anarkali paired with minimal makeup and maang tikka. 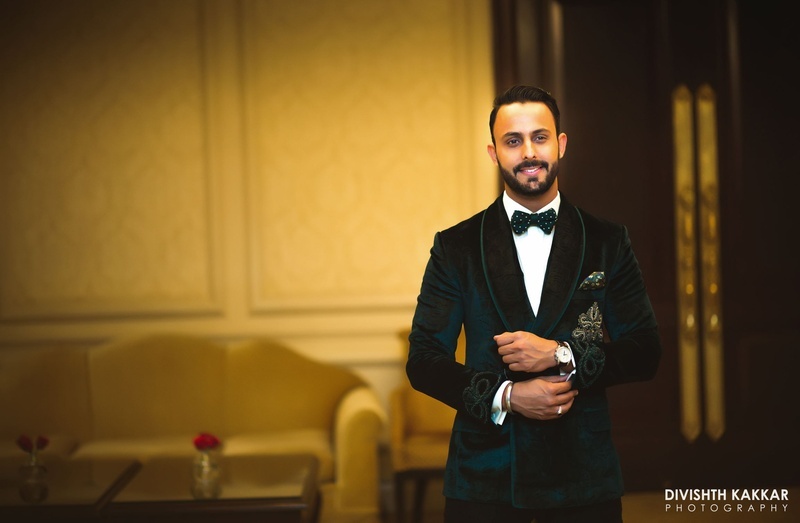 Sahil looking dashing in a dark olive green velvet three piece styled with a polka dotted bow. 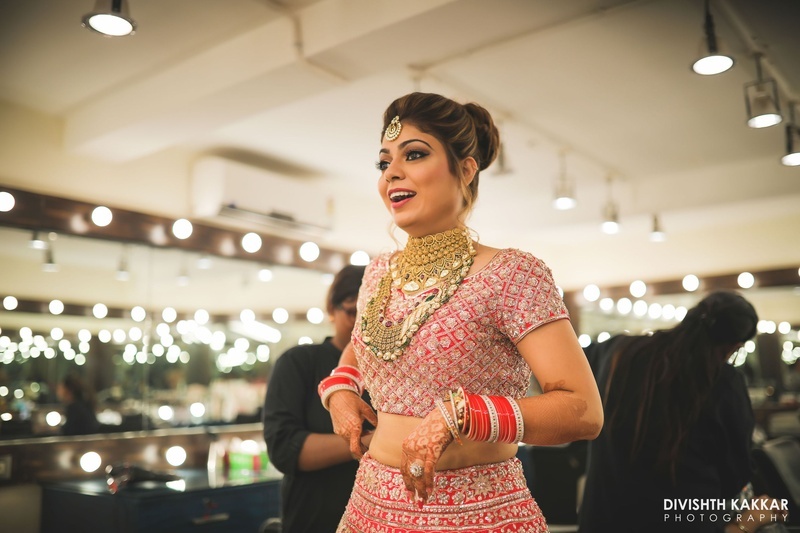 Dolled up in pretty lustrous eyeshadow! 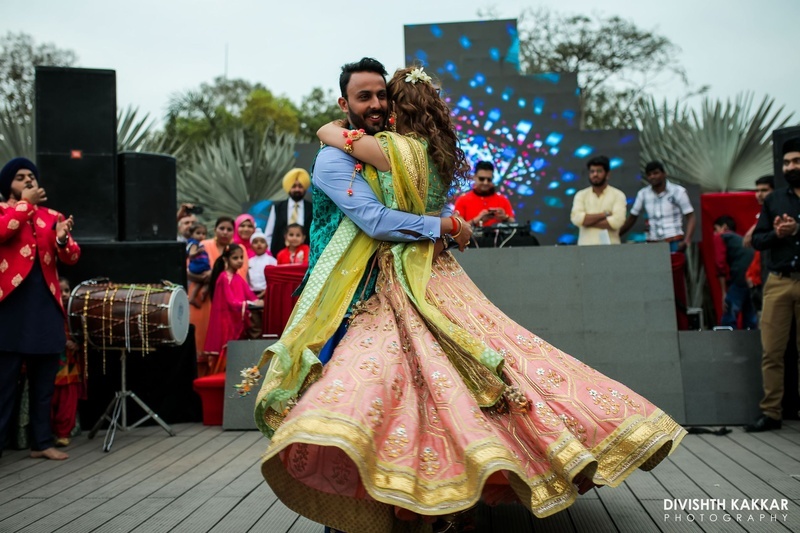 Sahil and Gurpreet at their dance performance. 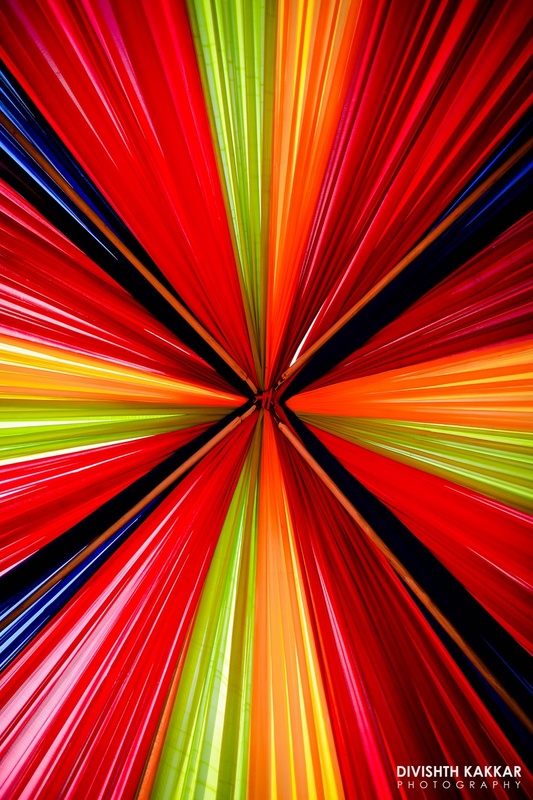 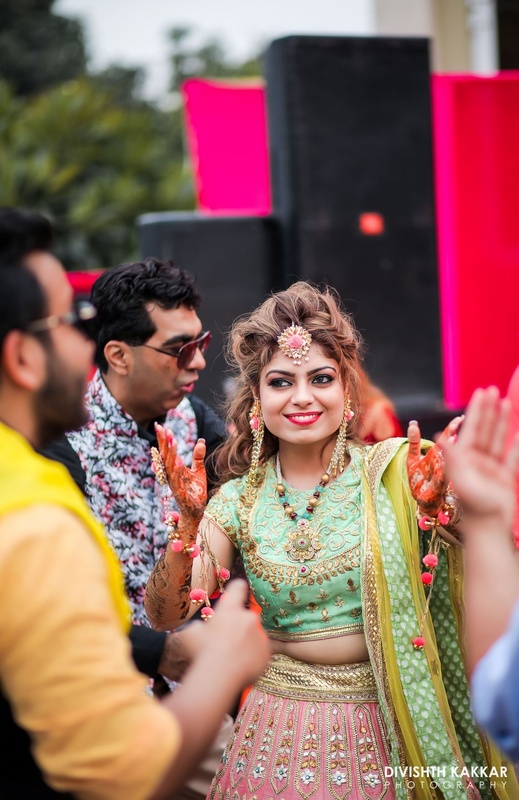 Colorful draped tent at the mehndi ceremony. 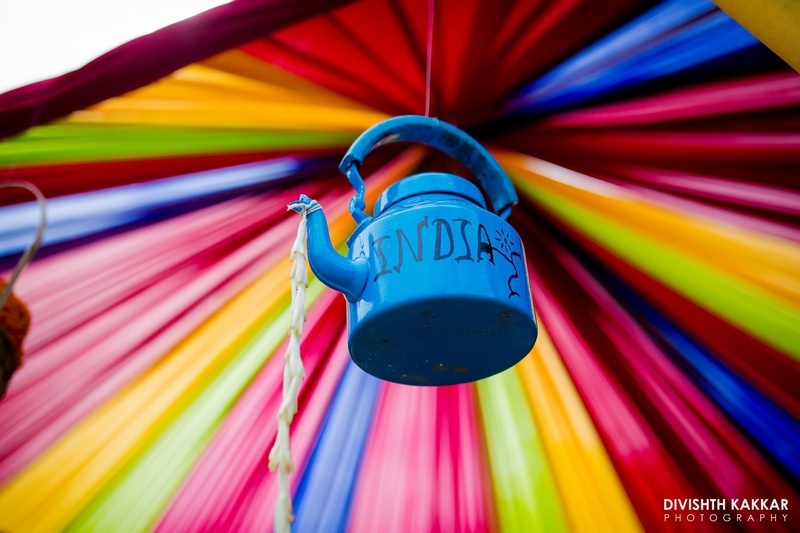 Quirky tea kettle decor for the mehendi ceremony. 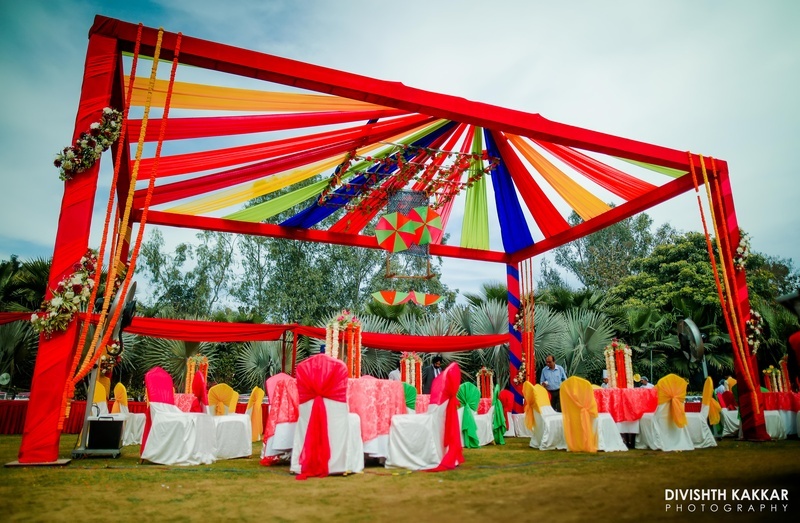 Colorful draped tent and bright and vibrant table chair setting at the mehendi ceremony. 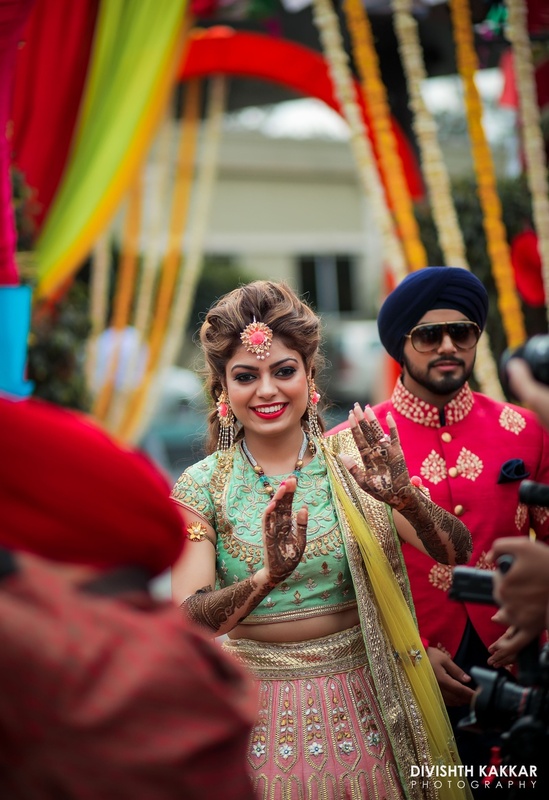 Gurpreet looked vibrant and pretty on her mehndi day. 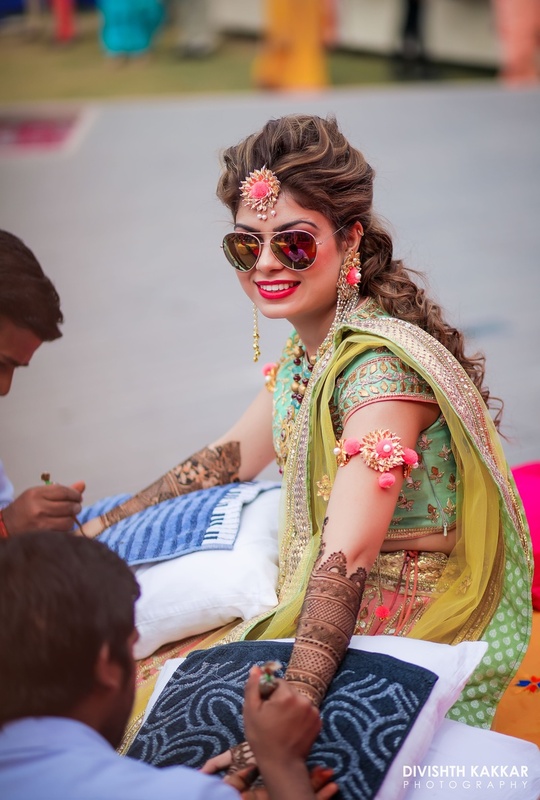 She wore a mint green and pink gota work lehenga styled with floral jewellery and the dapper shades of course! 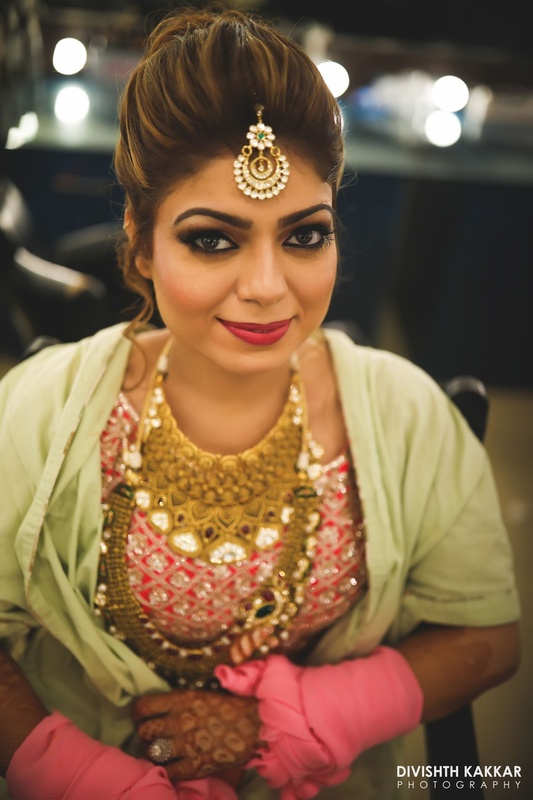 For her mehndi she had a lose hair do which looked fabulous with her outfit. 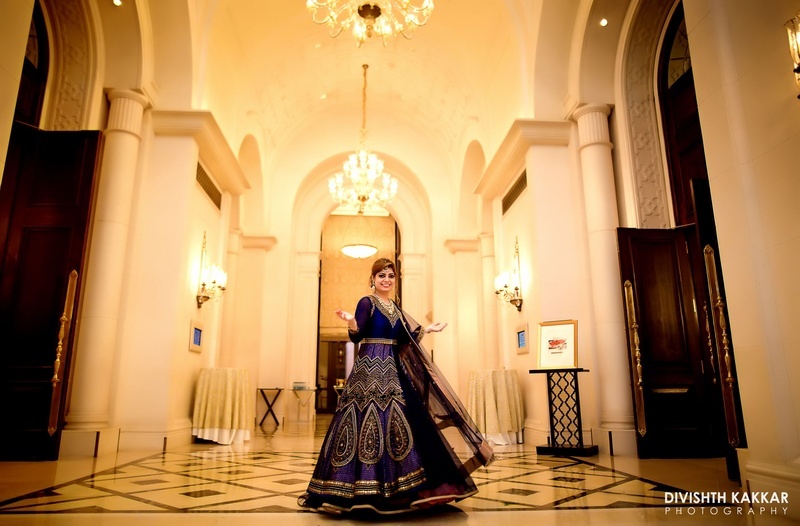 For the love of twirls and swirls, we are swept away! 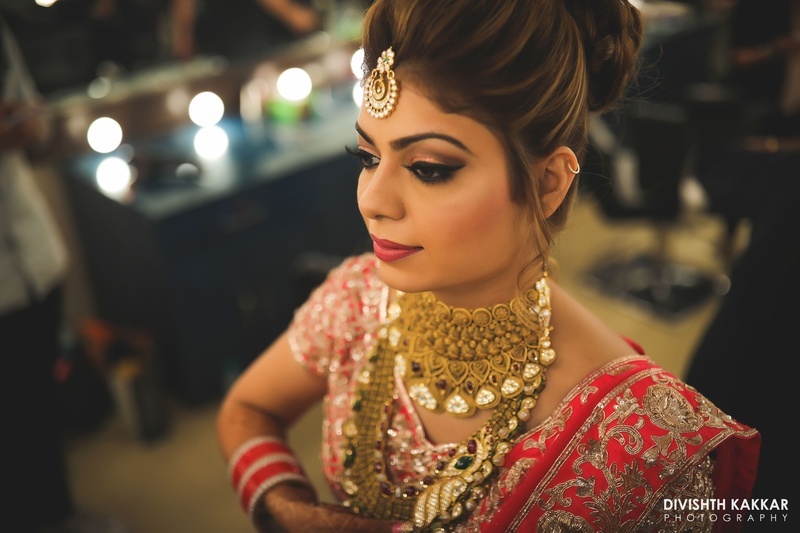 Flawless pretty pink makeup and a beautiful kundan maang tikka for the wedding day. 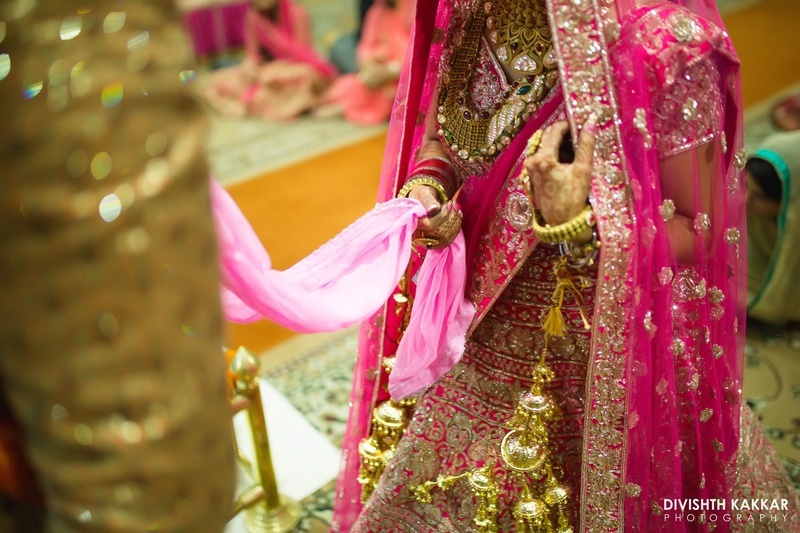 Pretty pink and silver wedding lehenga. 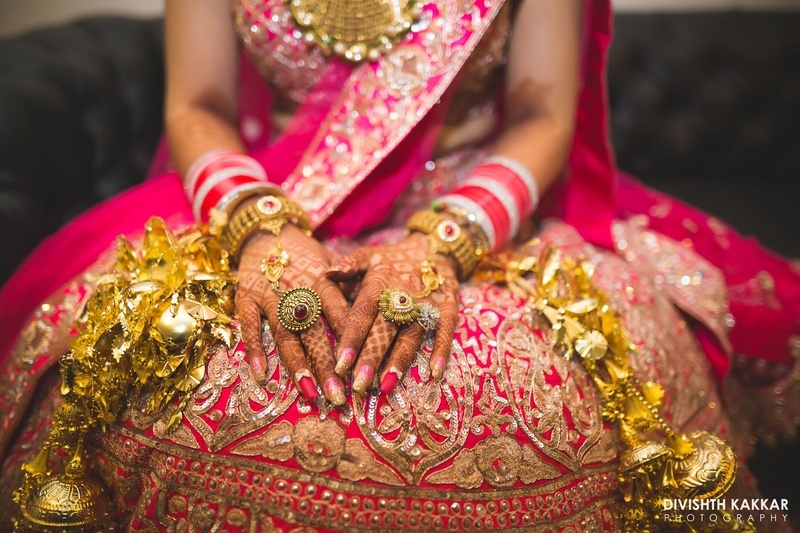 Bridal hands adorned with gold heavy kaleere and gorgeous rings. 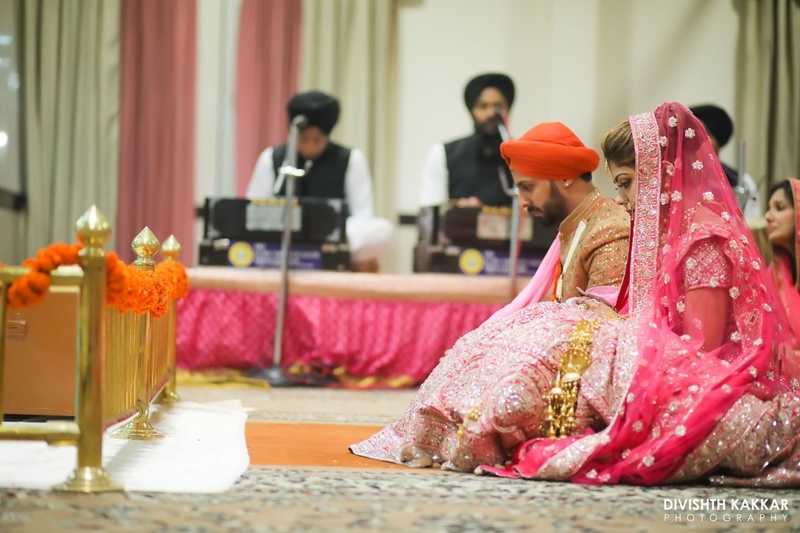 Bride and groom at their gurudwara wedding ceremony. 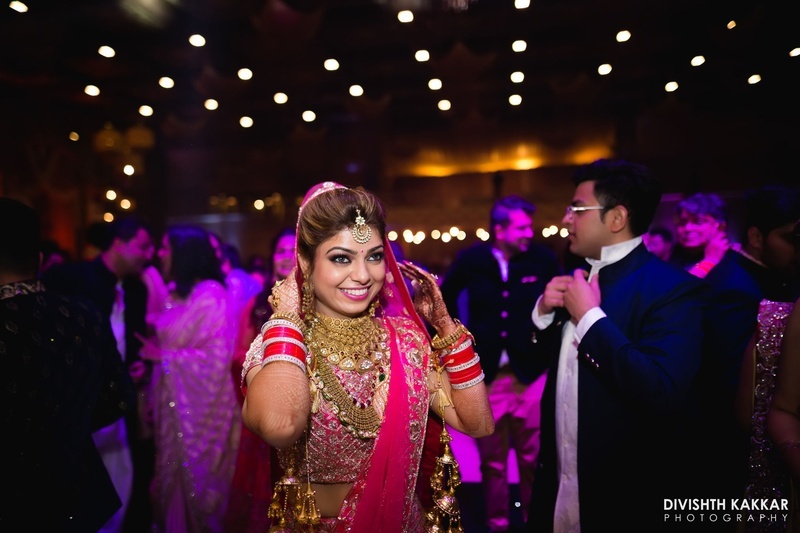 Bridal pretty pink details captured beautifully by Divishth Kakkar photography. 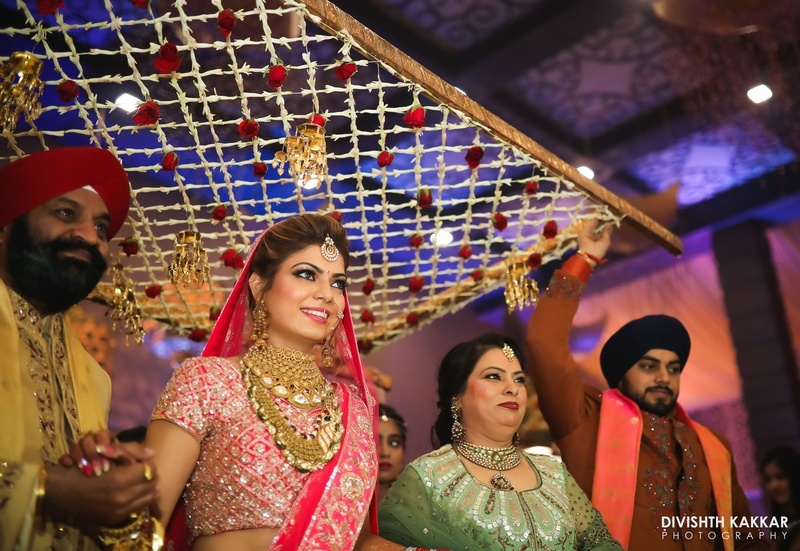 Bridal entry for the after wedding reception held at Vilasa by Ferns n Petals! 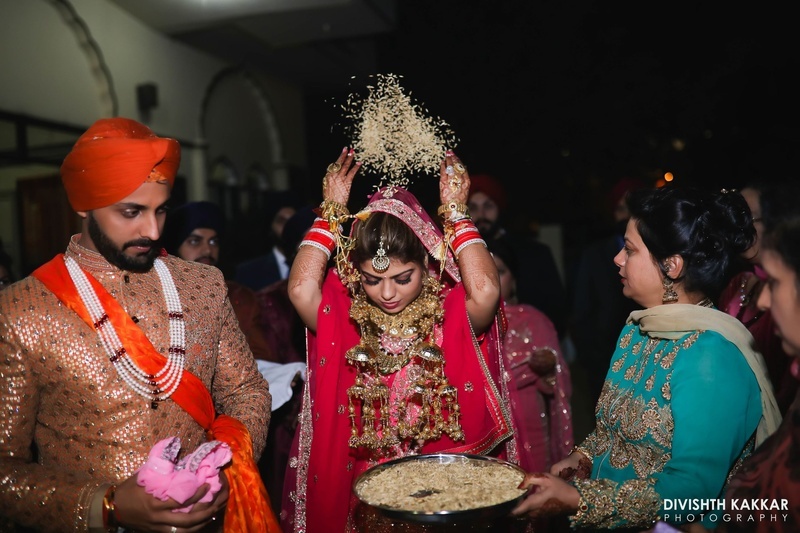 Varmala ceremony! 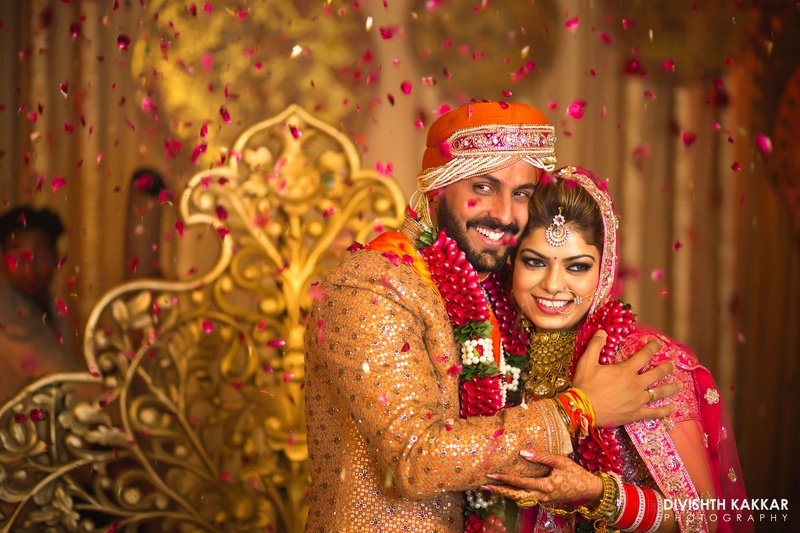 Bride and groom wearing beautiful flower garlands. 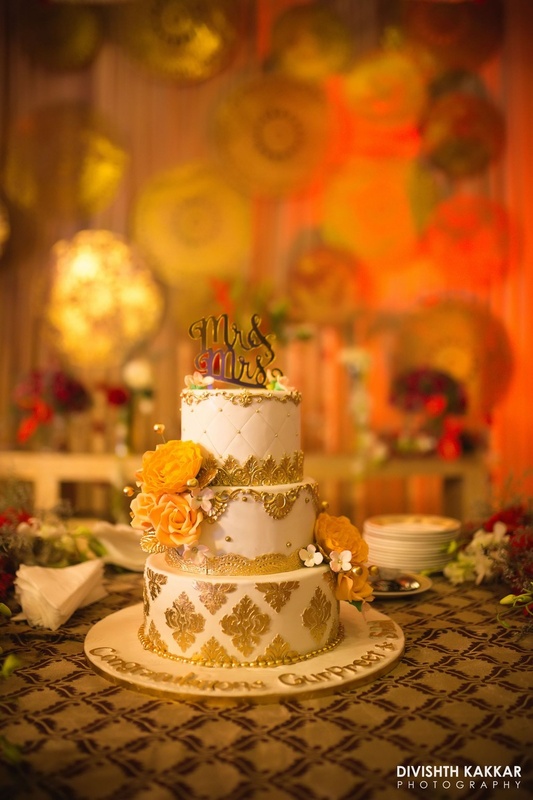 White and gold cake with cute cake topping on it! 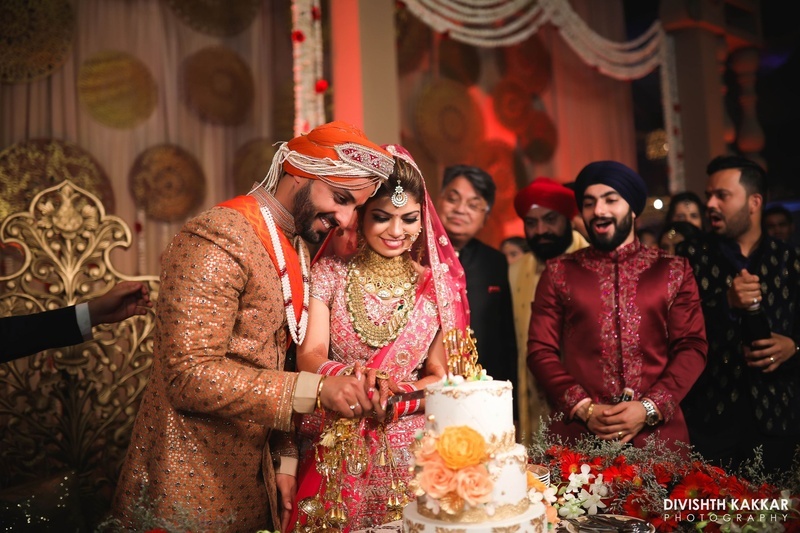 Sahil and Gupreet cutting their super cute wedding cake. 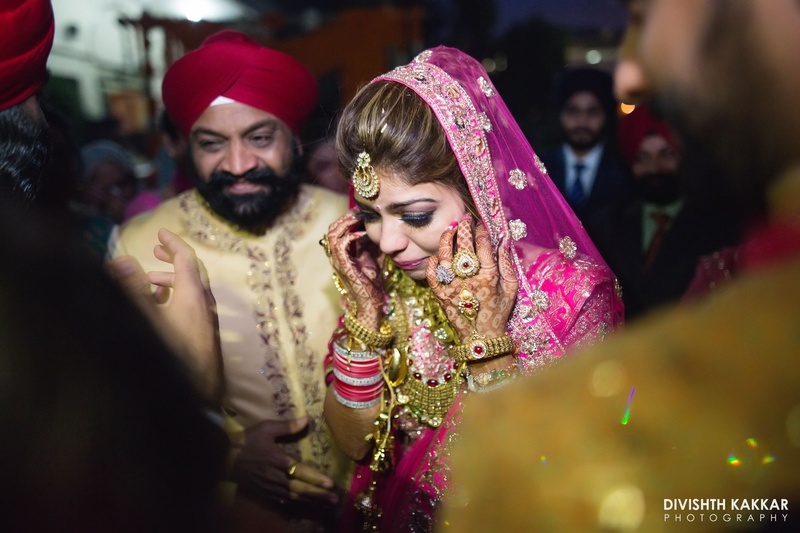 Emotional vidaai moment captured by Divishth Kakkar Photography.